We will use apt based client tool to install the certificate. So, it is just easy. Previously, we have written about Let’s Encrypt Project. Here is Step by Step Commands to Use Free SSL by Let’s Encrypt Project. 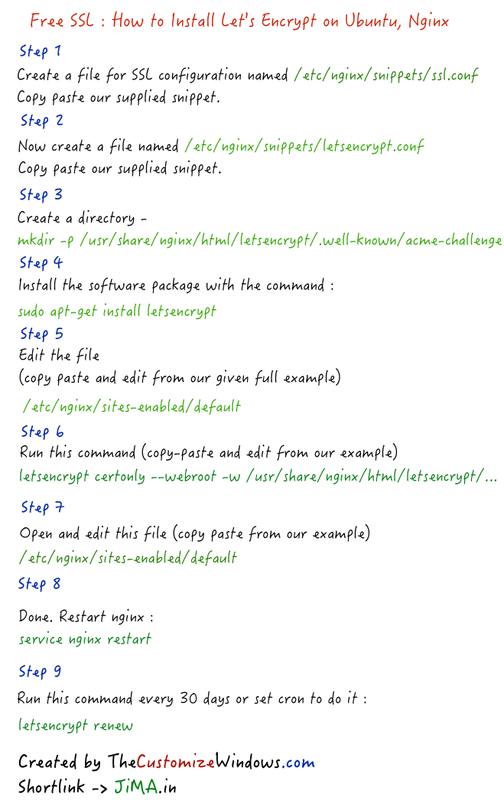 This is How to Install Let’s Encrypt on Ubuntu, Nginx for WordPress. You’ll get A+ on SSL Lab’s test with this method. For those who have an existing SSL certificate, they can use a subdomain to test or use the 301 redirected www subdomain. We are writing for Ubuntu 16.04 LTS, hence we will use apt-get install letsencrypt command to perform the works. There is separate thing – an agent software for Let’s Encrypt. Which is not present in case of paid SSL certificates. There are two modes for configuration. First is standalone, which replaces the web server to respond to ACME (Automatic Certificate Management Environment) challenges. Second is webroot. Where your web server to serve challenges from a known directory. Both of these are for when you do not want the certbot to edit your file. certbot is Let’s Encrypt client software. We are using webroot because it does not need replace Nginx bind to port 80 in order to renew certificates. We often give examples with acme.com as domain. What is this acme? Read on acme.com. That ACME is a group since 1970s promoting UNIX freeware. You can renew using the command letsencrypt renew. You can set a cron to run the command every 15 or 30 days. This Article Has Been Shared 1305 Times! Cloud Computing and increased usage of mobile devices and available official and unofficial applications has significantly increased the mobility of administration too. Checklist Secure Cloud Computing is the continuation and conclusion of previously discussed topic on Privacy issues of Cloud Computing. Cite this article as: Abhishek Ghosh, "Free SSL : How to Install Let’s Encrypt on Ubuntu, Nginx," in The Customize Windows, May 20, 2016, April 21, 2019, https://thecustomizewindows.com/2016/05/free-ssl-how-to-install-lets-encrypt-on-ubuntu-nginx/.